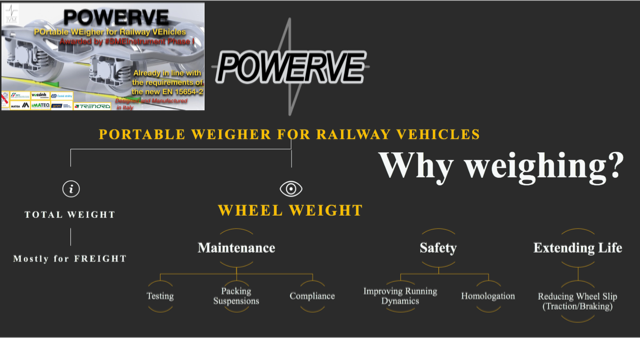 Why Weighing a Rolling Stock? Most of the time, when talking about weighing a rolling stock, one considers as first purpose to know the total weight and thinks that the best application would be connected to the freight transportation. This is true, but actually it is the least interesting aspect of the weighing topic. The most interesting purpose and the most difficult to evaluate as well is to weigh in order to check the set-up of the rolling stock on track. For this reason, we talk about measuring the vertical forces “Q” of each wheel on track. During the life cycle of any rail vehicle, without considering the weight changes, the distribution of the wheel forces is mainly a function of the wear of the wheel rolling surfaces diameters and of the suspensions stiffness. So, especially for mantained vehicles with worn wheels, measuring on the wheel tyre near the wheel reference point, instead of other points as the wheel flange or the axle box, is fundamental to correctly understand the real rolling stock balance on the track. Obtaining the best wheel force distribution allows to improve the running safety and to extend the life cycle of the wheels and the rails, because it minimizes potential slips during traction and braking. POWERVE is a hand-portable system, able to perfectly measure the vertical forces loaded from each wheel of a railway vehicle on the rail. It measures on a straight track and the load cells are interposed just between the top of the rail and the wheel tyre at the wheel/rail interface, not on the wheel flange. POWERVE measures the true rolling stock balance on the track, preventing derailments. What is your experience in weighing a rolling stock? What do you think about POWERVE? Share your thoughts and doubts!